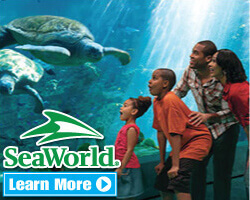 Whether you are heading to the East, West, or even central United States, there is a SeaWorld theme park just for you! Featuring locations in San Diego, San Antonio, and Orlando, each SeaWorld park has all of the exciting live aquatic animal shows, thrilling rides, and family fun that you’ve come to expect! 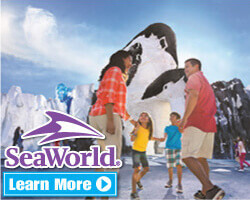 Each SeaWorld park offers its own equally entertaining vacation experience for the entire family. For more information or to make your reservations by phone, please contact us at 1-800-987-9852. Known for beautiful warm weather and stunning beaches, Florida visitors will love seeing the amazing exhibits and great rides of SeaWorld Orlando. Take an exciting ride on the Kraken, the tallest, fastest, and only floorless coaster in all of Florida. Or if you want to catch one of the great animal events, you’ll see a wide variety of exhibits including manatees, dolphins, manatees, sharks, turtles, sting rays, and even polar bears! There is even an exhibit dedicated to the noble and beautiful Clydesdale horse. 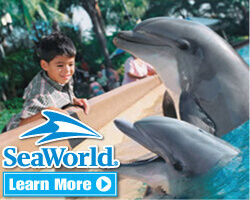 Open from March to November, the San Antonio version of SeaWorld boasts one of the most exciting destinations in Texas! Here you can catch a few exotic, aquatic sights, and visit the notable water park, Lost Lagoon. At the Lost Lagoon, you’ll see numerous slides, large wave pools, and a vast amount of restaurants to suit your taste. And if you want to take a ride, climb on to Texas’ very first inverted steel rollercoaster; “The Great White.” You’ll reach top speeds of 50mph on this over 2,500ft coaster! 22 acres of zoological marine attractions and thrill rides along Mission Bay are ready for you to come explore in beautiful southern California year-round. Here you can see great shows like Blue Horizons, which brings soaring birds, playful dolphins, and thrilling aerialists all together for a grand experience; or Pets Rule!, where you’ll get lots of laughs from an unlikely cast of characters from pigs, cats, dogs, birds, and more. And of course you can satisfy the thrill seeker within with a ride on one of the parks many great rides. Shamu may be one of the most misunderstood pieces of Americana, and for good reason: it seems like no matter which park or what year it is, Shamu can be found at SeaWorld. So, to help clear the confusion, here's the scoop on the famous killer whale. Shamu was the name of the first killer whale to grace SeaWorld, in the 1960's. Today, Shamu is the stage name used by all performing killer whales at all SeaWorlds. Each of the killer whales has their own personal name, but to help carry on the legacy and tradition of the original Shamu, the name is still used to this day. So no matter which SeaWorld you visit, you’ll see a piece of American history!